Carlo Ancelotti is to leave Real Madrid after just two seasons in charge. Ancelotti’s future at the Bernabeu has been the subject of intense speculation for some time and the club confirmed on Monday that he will leave following a trophyless campaign. The former Chelsea manager guided Los Blancos to a record tenth Champions League title in 2014 but they missed out on a place in next week’s final when they were beaten by his former club Juventus in the semi-finals. As well as a Champions League victory, Ancelotti led Madrid to the Copa del Rey in his debut season, while the club went on a 22-game winning streak during the first half of the current campaign. However, their form dipped after the winter break and they found themselves eliminated from the Copa del Rey at the hands of Atletico Madrid. I want to tell you that we have decided to relieve Carlo Ancelotti of his duties as Real Madrid coach,” Real Madrid president Florentino Perez told a news conference. “It’s been a very difficult decision for the board but as I always say, we haven’t come here to take the easy decisions but the best decisions for the institution. 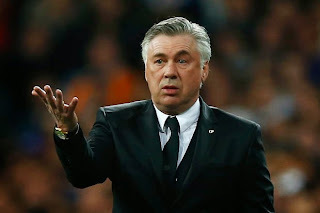 “Carlo Ancelotti in these two years, has won the affection of the board and my personal affection and that of the fans. Carlo is part of our history. But as we all know, in Madrid the demands are great. We think it’s time for a new impulse which can allow us to win new titles and achieve our maximal level of competitiveness. Despite being linked with a return to AC Milan, Ancelotti intends to take a year off to undergo surgery on a back problem. “I reiterate that I will take a year off,” Ancelotti said ahead of Monday’s announcement. “More so because I have a serious reason to stop. I must have a back operation because of a (cervical spinal) stenosis that for some time creates a tingle in my hands. “If I waste more time it could extend to my legs and this is why I have made an appointment to have the surgery done.